The Tunisian Navy has commissioned two new vessels into service: its second Multi Service Offshore Patrol Vessel from Damen and a third locally manufactured patrol boat. The vessels were commissioned at the port of La Goulette on 25 June by President Beji Caid Essebsi, according to the Tunisian Presidency, to coincide with the 62nd anniversary of the national army. The ceremony included demonstrations by the Tunisian Navy which saw boarding operations by Navy RHIBs and the deployment of sailors onto a vessel by UH-60 helicopter. 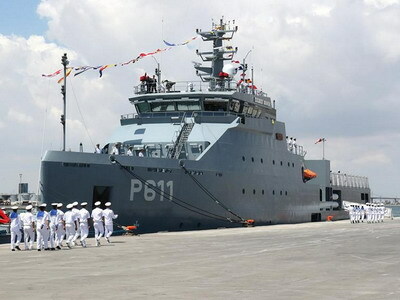 The second Multi Service Offshore Patrol Vessel (MOPV) 1400, named Syphax (P611), was taken into service along with the Kerkouane (P212) patrol boat. Tunisia ordered four MSOPV 1400 vessels from Damen in 2016, with the first of class, Jugurtha (P610), delivered in March this year. The vessels are being constructed at Damen’s shipyard in Galati in Romania, with Syphax being completed on 2 May. The other two vessels on order (Hannon and Sophonisbe) will be delivered by the end of 2018, according to Minister of National Defence Abdul-Karim al-Zubaidi. Hannon, began sea trials on the Black Sea on 26 June. The MSOPV 140s have a length of 72 metres, a beam of 12.7 metres and a draft of 3.75 metres. The vessels displace approximately 1 284 tonnes and are powered by two Caterpillar engines delivering a total of 7 060 kW, giving a top speed of 20 knots. The MSOPV is Damen’s second generation offshore patrol vessel design and incorporates Damen’s Sea Axe hull shape for superior seakeeping – the new OPV is fuel efficient and capable of speeds up to 25/26 knots, Damen said. A Multi-Mission Bay can be equipped with dedicated mission modules and a nine metre RHIB (rigid-hulled inflatable boat), which can be launched over a dedicated slipway through the rear of the vessel while the OPV is sailing. The Multi-Mission Hangar is capable of storing a helicopter and an unmanned aerial vehicle (UAV). The Kerkouane was locally built by the Societe de Construction Industrielle et Navale (SCIN) in partnership with the ministry of defence and was launched on 8 May this year. The first of class, Istiqlal (P201), was launched in August 2015 and the second, Utique (P211) was launched in March this year. The 80 ton vessels are 26.5 metres long and 5.8 metres wide. They are powered by two Rolls-Royce engines, each of which produces 3 200 horsepower, giving a top speed of 25 knots and a range of 600 nautical miles. Armament includes a 20 mm cannon and two machineguns. Accommodation is for a crew of 12 sailors. The vessels are fitted with a thermal imaging camera. During the ceremony on 25 June, al-Zubaidi said Tunisia has benefitted from the delivery of new assets over the last two years, including the offshore patrol vessels, UH-60 helicopters, 400 trucks and 30 armoured vehicles.